It's that time of the year again when whole India will lit up like a fairyland. yes, It's Diwali, the biggest festival of India, we are expecting in 10 days. That means every family will gear up to buy gifts for every family members and relatives. Diwali time means painting the house or giving house a new makeover like we dress up in new clothes. And also Diwali means for Indian families, making different types of sweets at home for loved ones. We feel great pleasure serving our families fresh home-made delicacies to our families, it's all part of the celebration. At the same time, if the sweets or desserts we make gives lots of nutrition to our families, that gives us double pleasure. Laddoos are very common sweets made during Diwali. I happened to find my favorite Lion Dates which had offer of BUY1 GET 1. I immediately picked two packs and then this idea of making dates laddoo came to my mind. 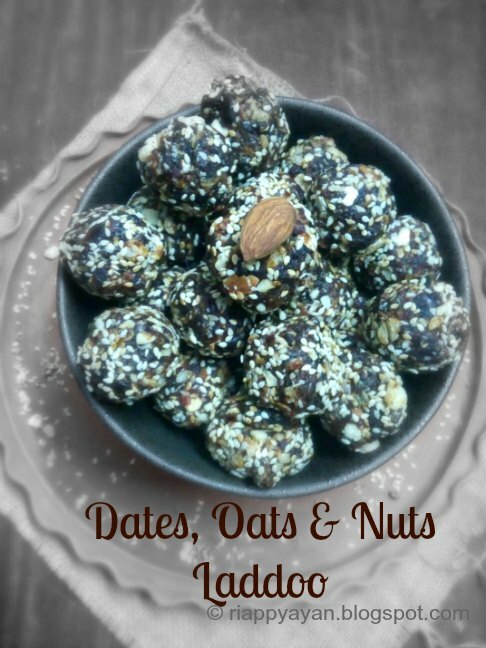 I made these Dates, Oats & Nuts Ladoos for my family. I made laddoos with dates and added quick instant oats for extra crunch and walnuts and almonds for wholesomeness and covered the ladoos with Til or white sesame seeds. All the ingredients are full of fibre and good proteins. 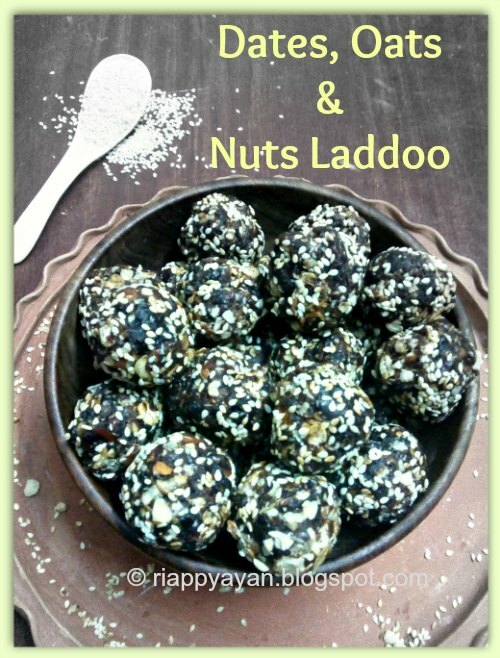 You can add other alternatives also in this laddoo like coconut or chocolate chips or your choice of nuts etc. Since dates are naturally sweet, you don't need to add any extra sweetner/sugar to these laddoos although you can if you want to. This one laddoo will fullfill your dry fruits & nut requirements for the day. And it tastes great with all these goodness and crunch from nuts and sesame seeds. It's hard to eat just one. It's a total guilt-free and healthy snack which requires no elaborate cooking n stirring like other Indian sweets. 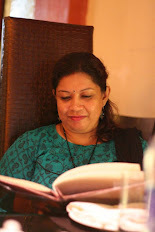 I have not used any ghee or butter or extra sweetner in this recipe. You'll be hooked once you try it. First de-seed the dates. Then chop into halves and take them in a microwave proof bowl and micro for 3-4 minutes or till they start to soften. This process will soften the dates enough. Heat a non-stick wide pan, transfer the softened dates to the pan and continue stirring it in medium flame. About 5-6 minutes later, you'll see the dates are becoming soft and mashed up. Now add crushed nuts and oats in there. Switch off the flame and try to incorporate the nuts and oats with dates. It'll be little sticky first but it'll be mixed with dates in no time. After all of these are mixed up, transfer the content to a wide dish. In another plate, take til or sesame seeds. Now take a little amount of dates and nuts mixture and roll into a smooth ball on your palm. You can take a drop of ghee on your palm to roll them easily or can just avoid it. After you make a ball, roll it over the sesame seeds and keep aside. 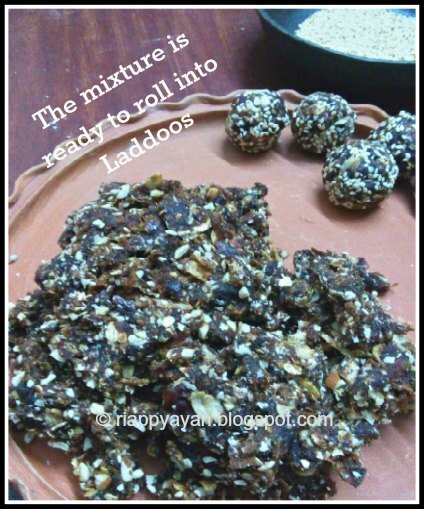 Make rest of the laddoos the same way. 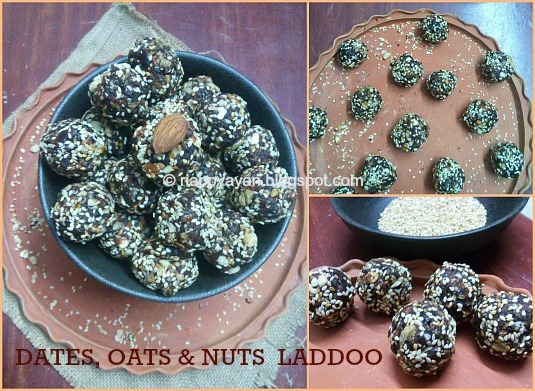 Hope you are making these delicious and healthy dates and nuts laddoos this diwali. You can distribute these sweets among your family and friends as it's a common tradition during Diwali to distribute dry fruits to family and relatives to wish them good luck and good health. Also these sweets are easy to pack as they can hold their shapes and you can store these laddoos in room temperature for at least 2 weeks. So, enough reasons to try these gorgeous beauties this Diwali, isn't it..so go ahead and surprise your friends.............they'll bless you for sure. RECIPE INDEX and go down to Sweets/dessert section for more options.